Toeniskoetter Construction’s ground-level exterior modernization has provided a much-needed face-lift for the commercial building located at 333 W. Santa Clara Street in San Jose. Originally built in 1982, the building’s dated blue canvas awnings have been replaced with a modern combination of wood veneers and aluminum accents, creating a more contemporary façade and revitalizing the connection to the street and surrounding downtown core. Designed by HGA Architects & Engineers, the building is now accented with sleek, wood-veneered resin canopies with painted aluminum frames, which provide solar protection to the large, two-story windows along the southern and eastern façades. The canopies were required to be demountable, so some portions can be temporarily removed and large portions can be temporarily swung down in front of windows. 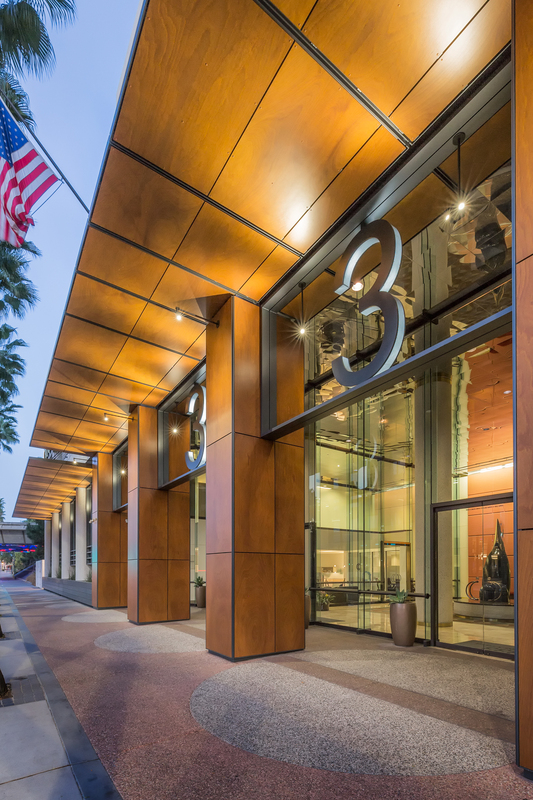 The building’s entrance was dramatically enhanced by cladding four existing concrete columns with wood-veneered resin panels and suspending the address -- 333 -- in large aluminum numbers over the entry. New LED lighting showcases the gleaming wood surfaces and brings a warm glow to the street in the evening. Existing concrete planters were covered with painted aluminum planter boxes, extending the contemporary expression to the pedestrian level. While the result is striking, the work behind the scenes to make it happen is equally impressive, starting with the special orders of wood veneer laminates from Spain and custom aluminum cladding from Germany. “It was a complicated coordination process with all the trades to stage all the work properly,” said Gary Dam, Toeniskoetter Construction, Inc., Executive Vice President. “We also had to create a pedestrian bypass to allow walking space and make sure there was access to the front door throughout construction.” The sidewalk in front of 333 West Santa Clara is a main throughway for Sharks fans and concertgoers to walk from downtown San Jose to the SAP Center, so pedestrian safety and access was a top priority throughout the project.